"Dan will show you how to communicate your unique contribution, so that you make yourself indispensable." - From the Foreword by Marcus Buckingham, New York Times bestselling author of Now, Discover Your Strengths. How people perceive you has always been critical to a successful career. Now add in the internet, social media, and the unrelenting hum of 24/7 business, and the ability to brand and promote yourself effectively becomes absolutely essential for young professionals to land the job, earn the raise, or get that much deserved promotion. It is only with the ability to promote yourself that managers and executives can see Gen Y workers as invaluable employees, game-changing managers, or the people whose names are synonymous with success. So, how do they stand out and get ahead? Drawing on proprietary research and countless interviews with the most dynamic professionals in business today, career guru and founder of Millennial Branding Dan Schawbel takes readers through his step-by-step process of creating unique personal brands and leveraging them to maximum advantage. By basing these brands on the rock-solid foundation of hard, soft, and online skills that are essential to get the job done right and by knowing exactly what managers value, Schawbel provides every reader with the unique skills and message that they'll need to get ahead today and for the rest of their careers. The subtle and amazingly effective art of self-promotion is the razor-thin difference between success and failure. 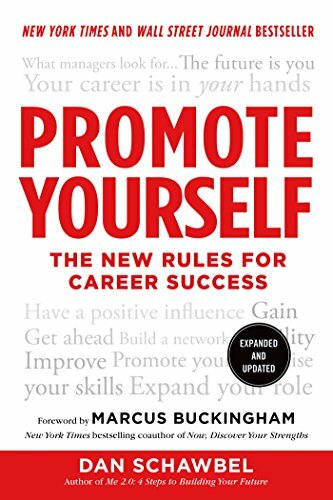 Dan Schawbel's Promote Yourself: The New Art of Getting Ahead is the definitive book on the new rules for building an outstanding career. A 360 degree view of the 21st century workplace and how to navigate it successfully. Over 75 interviews with executives, managers and millennial employees from the most prestigious companies in the world including American Express, Ernst & Young, PepsiCo, Google, GE, LinkedIn, Fox News, Cisco, Aflac, State Street, Mattel, Adidas, Pandora, The New York Times, Tyson Foods, and more. An exclusive research study in partnership with American Express revealing the top 10 attributes managers are looking for when promoting and more. Cutting edge advice on how to create your own career path, turn your passion into a new position and become a successful intrapreneur at your company.